SEOUL, May 9 (Yonhap) — K-pop idol group BTS, also known as the Bangtan Boys, will attend the Billboard Music Awards 2017 next month, its management agency said Tuesday. Big Hit Entertainment confirmed the boy group will attend the global music festival slated to take place at the T-Mobile Arena in Las Vegas at 8 p.m. local time on May 21. 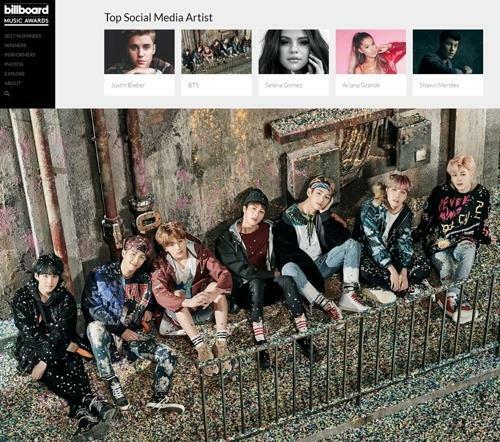 The seven-member group has been nominated for “Top Social Media Artist,” competing against Justin Bieber, Selena Gomez, Ariana Grande and Shawn Mendes. The winner will be chosen based on album and digital song sales, streaming, radio airplay, touring and social engagement for one year starting from March 18 last year, as well as the result of a global online vote by fans, the awards organizer said. The group will walk the red carpet prior to the main awards event, the agency said.